It was a lovely bright day last Sunday so I decided to walk from Thames Ditton to Surbiton Station to start my journey back to Norwich. I had just spent the weekend visiting my mum to celebrate Mother’s day. 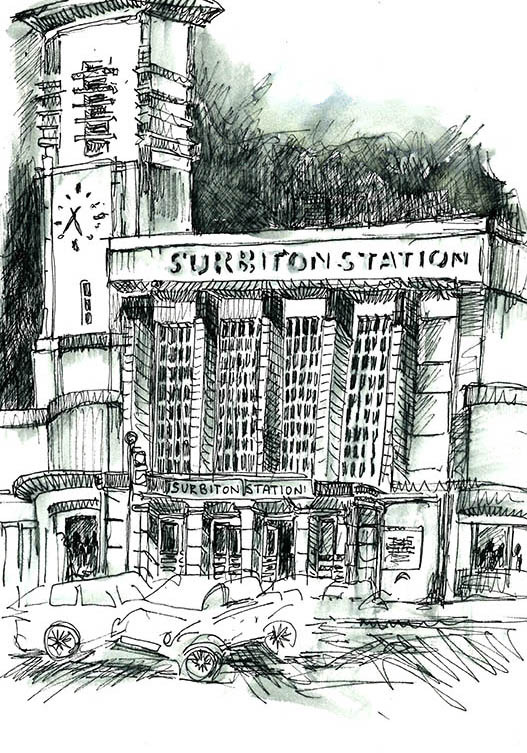 This gave me the opportunity to sketch the stark white modernist railway station I had admired for so many years. I had about an hour before I needed to catch my train. 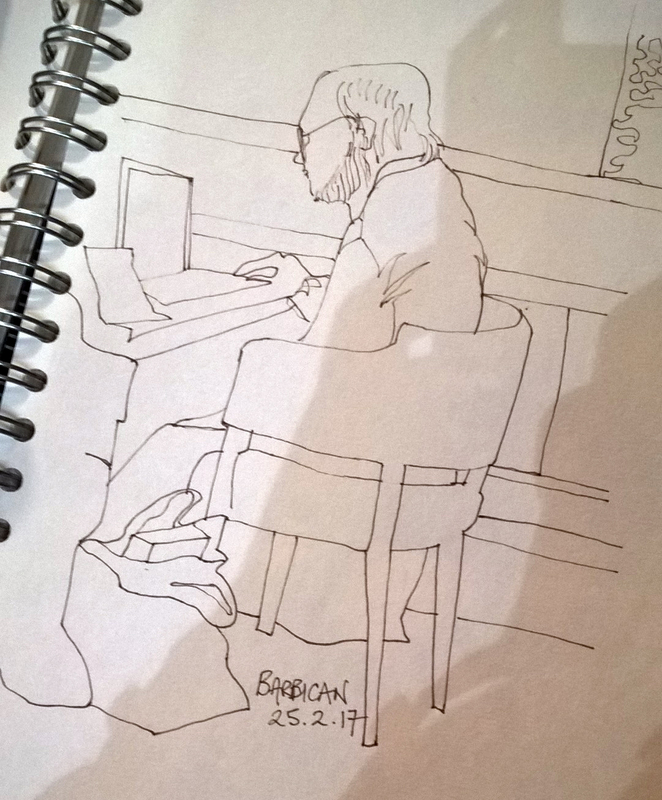 I spotted a table outside a pub near the station with a perfect view for sketching. Surbiton is situated in a southwest suburb of London along the Thames River. 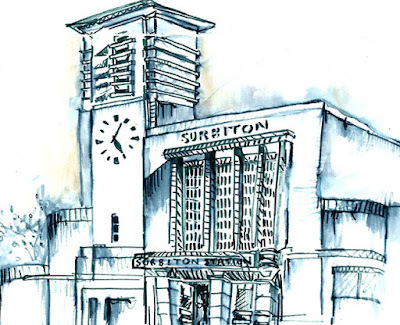 The station is the work of the Southern Railway’s architect James Robb Scott and was renovated in the early 30’s, opening its doors again in 1937. It is constructed of reinforced concrete. In 1998 the station had a refurbishment and it is now a grade II- listed building. It was great to observe the art deco style of curved forms, the long horizontal and vertical lines, which were iconic of that period, along with the beauty and simplicity of the san serif typeface used in the signage. 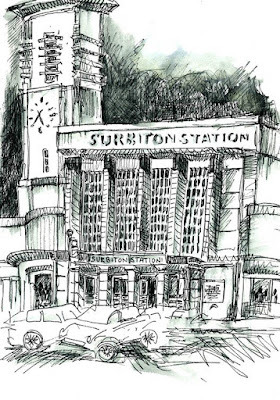 Surbiton’s claim to fame, is that it is the station that Professor Dumbledore whisks Harry Potter away from in Harry Potter and the Half- Blood Prince, filmed in late 2007. 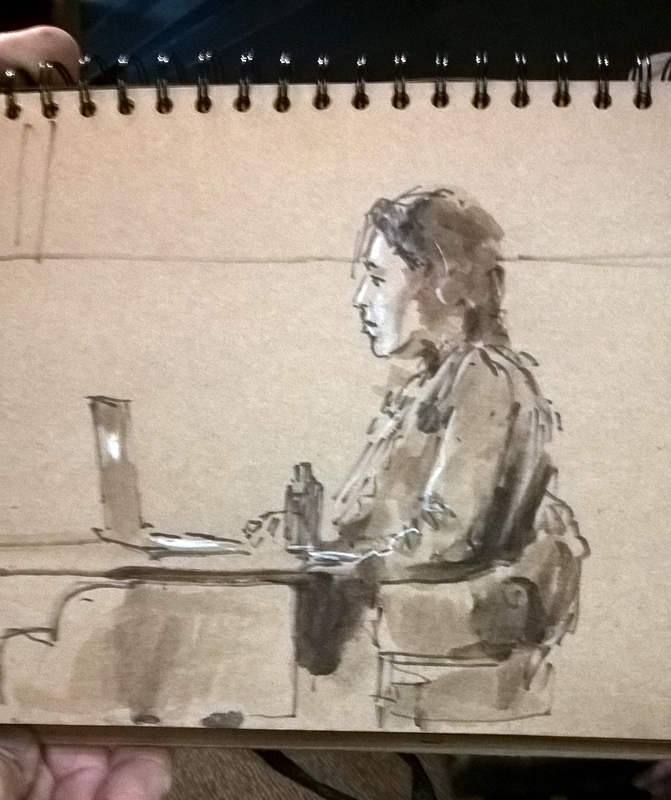 Not sure my proportions are quite accurate but I managed to capture the essence of it. 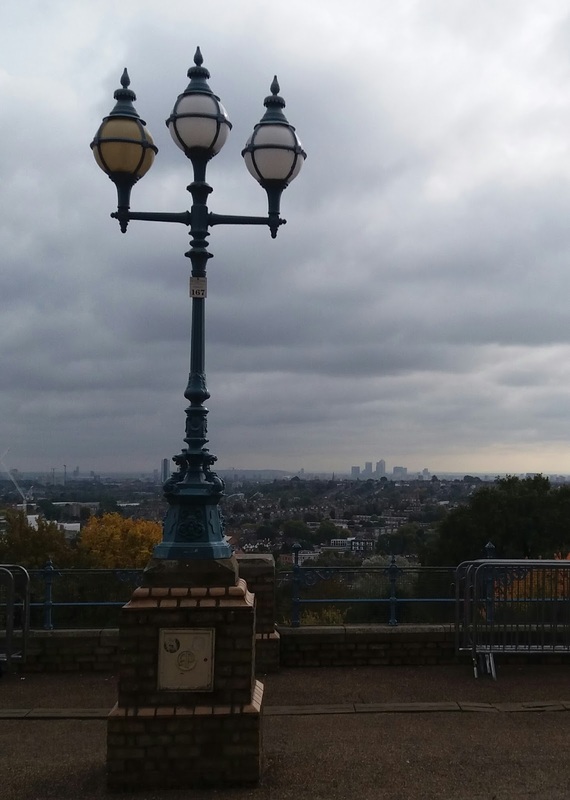 Join us at the Alexandra Palace, perched high on a hill overlooking north London. Ally Pally's once grand buildings are a little battered these days but still dramatic, the terrace offers panoramic views over London, and the 196 acres of park host all kinds of activities. 11am: Meet at the east end of the terrace, outside the BBC studios. It still has the old transmitter mast on top so you can't miss it. There should be enough shelter under the colonnade if it's raining. 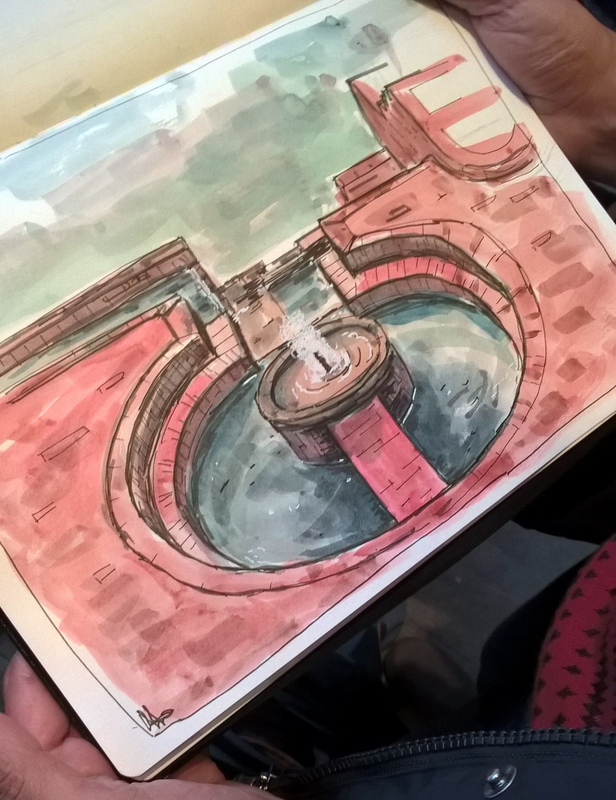 1 pm: Meet to share sketchbooks and experiences down by the boating lake, outside the cafe if it is fine, inside if it is wet. 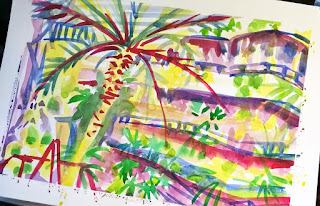 3.30 pm: Finish back up at the main building to share sketchbooks and take group photos, on the corner terrace outside the Phoenix pub and restaurant if it is fine, inside if it is wet. 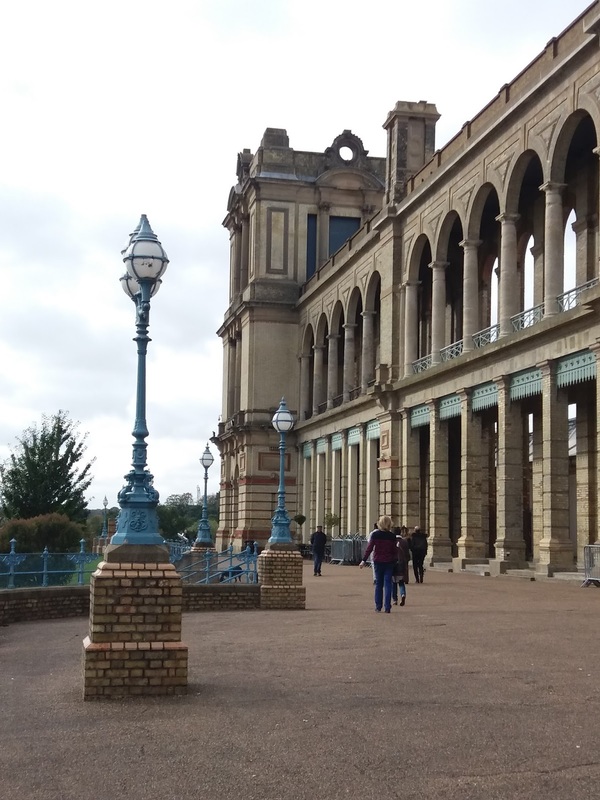 Alexandra Palace was built in 1873, as a place of public entertainment. It opened on Queen Victoria's birthday with great celebrations, but just 16 days later caught fire and burned down. 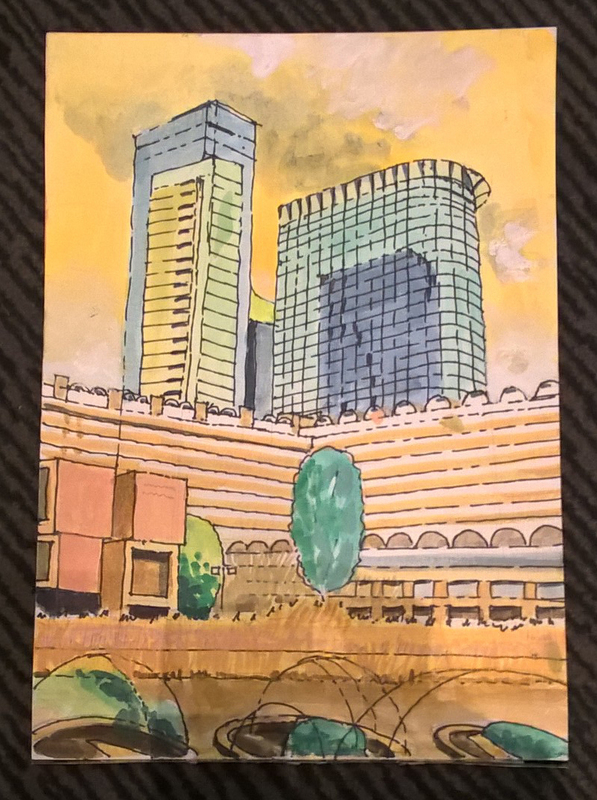 The replacement building, which opened two years later, lasted somewhat longer, but in 1980 it caught fire again; people came out to watch the blaze from vantage points right across north London. 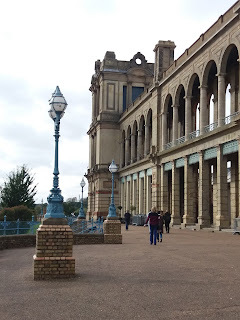 In its day, Ally Pally has served many purposes. An early airship was built and flew from there. In the first world war it was used first as a refugee camp, and then as an internment camp for enemy civilians. Then, in the 1930s, the BBC studios were the site of the world's first regular, high definition, public television broadcasts. Nowadays most of the building has been repaired, but restoration work is still going on to the Victorian theatre and the original BBC studios. It hosts regular exhibitions and concerts. Our sketchcrawl will coincide with the Country Living Spring Fair, so it will be busy. The Great Hall with its splendid organ will be in use for the event; you won't be able to draw in there without buying a ticket, but if you are tall enough, you can see the organ through the round windows in the external doors! The building itself is huge and theatrical, with polychrome brickwork and lots of arches. 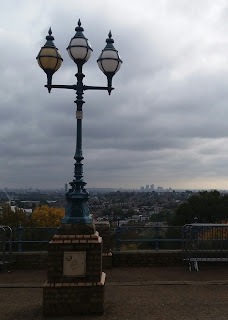 The surrounding terrace gives long views out across London. In the grounds you will find a rose garden, a lake with some particularly bonkers boats, a tree top climbing facility, pitch and put, a skate park and children's playgrounds. The area known as the Grove has an ancient oak and some wooden sculptures. 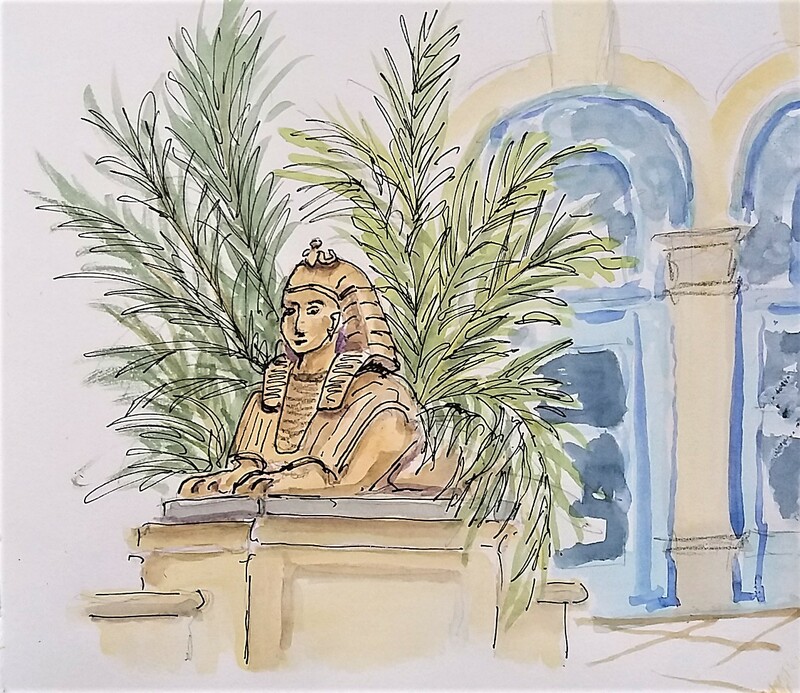 If it's wet: One of my favourite bits of the Palace is the palm court, just inside the main entrance, with potted palms, pyramids and sphinxes. If we can't go in through the main door because of the event, we should be able to get to the palm court by going through the pub, which has seating in the court. The Palace is also home to an ice rink, which has spectator seating. This is open to the public. There is a charge of £1.50, but it does include a cup of tea or coffee. I have been assured that they don't mind if we draw the skaters. The Lakeside cafe has glass sides, so you could hole up there and draw the lake and boats in one direction, the treetop walkway in the other. There's also a garden centre in the grounds, which has a particularly fine collection of Ali Baba pots; you could draw those under cover. As well as the Phoenix bar/restaurant in the main building, there are other cafes scattered around the grounds. 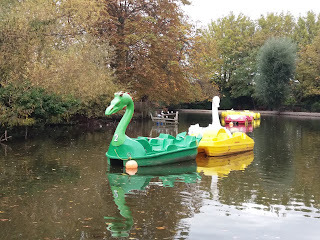 There's the cafe by the Lake, a good, rather more genteel cafe in the garden centre and a little Italian cafe and sandwich bar in the Grove. 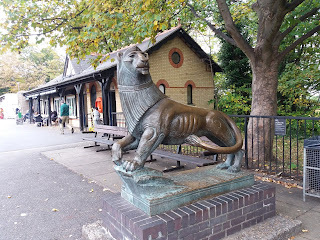 There's also a fine Victorian pub opposite Alexandra Palace Station, which I'm told is rather good. There are plenty of toilets. 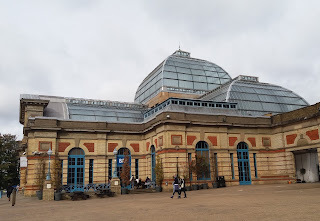 Alexandra Palace Station (Zone 3) is on the rail line from Moorgate to Letchworth, Hertford and Welwyn Garden City (passing through Highbury and Finsbury Park on the way). 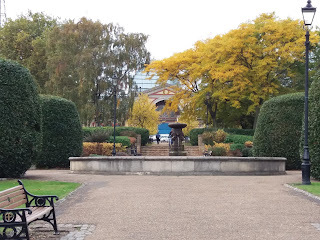 It's quite a stiff walk up to the Palace from the Station, but you could always hop on the W3 bus. 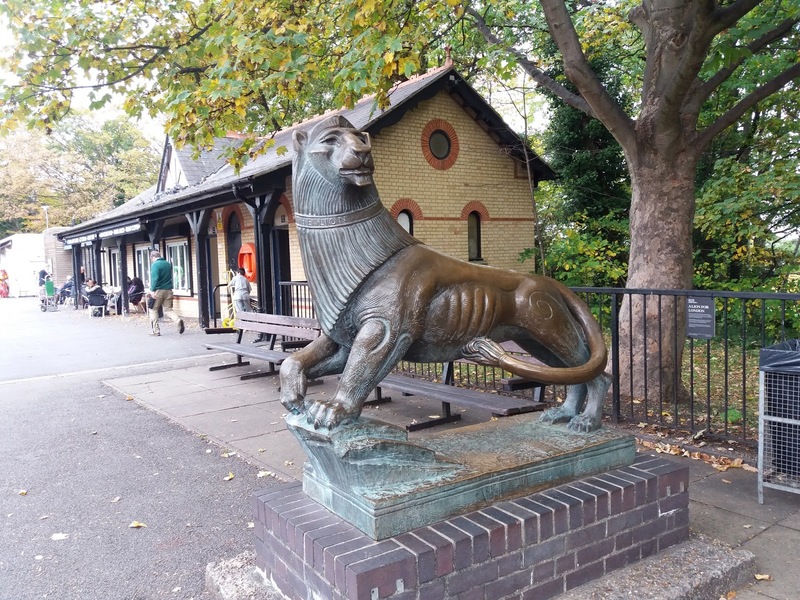 The W3 bus runs right through the park, up to the Palace itself, and links it to the tube at Finsbury Park (Victoria Line) and Wood Green (Piccadilly). 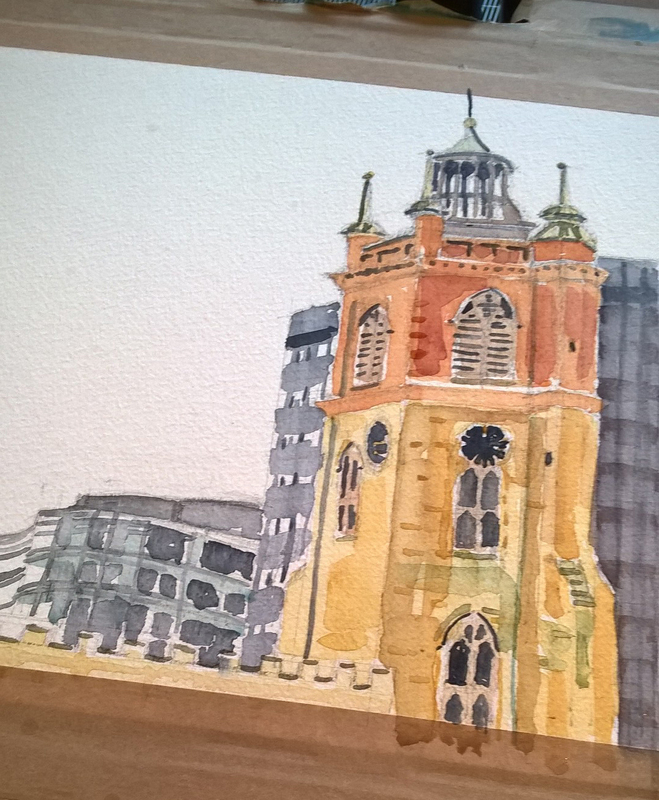 This is one of the few London venues where it might make sense to come by car. There are huge car parks (1,500 free parking places, according to the website). 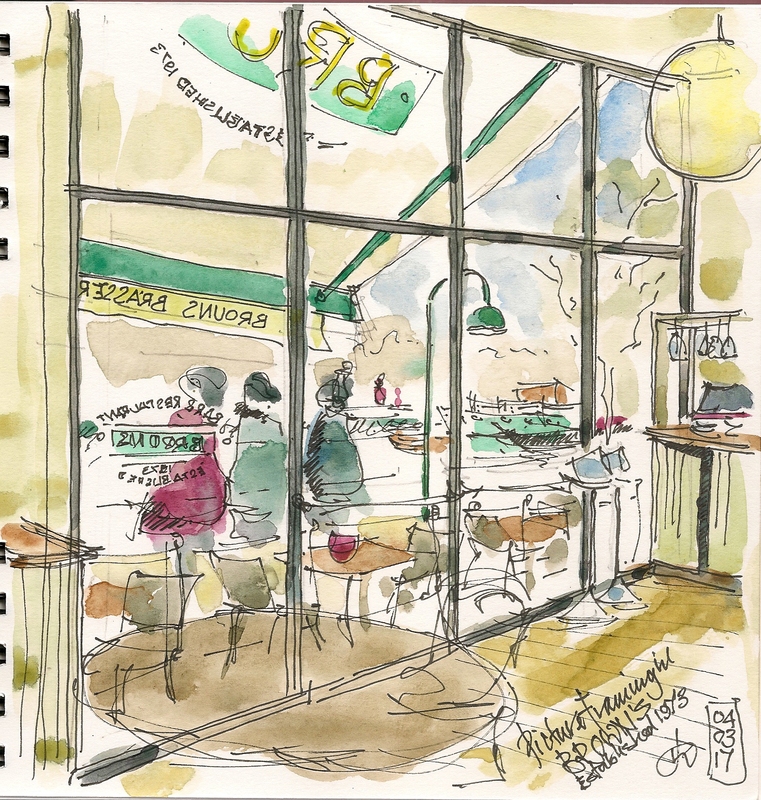 Occasionally I sketch on a saturday morning with a local group on SW London who this week chose the Kingston-upon-Thames waterfront. Kingston has gone through some remarkable changes in the last decade or two. One being the walk upstream of the bridge now almost entirely cafe society, with its alley links through to the Market Place. Leaving aside any social considerations of which the range will be wide it is a successful built regeneration. 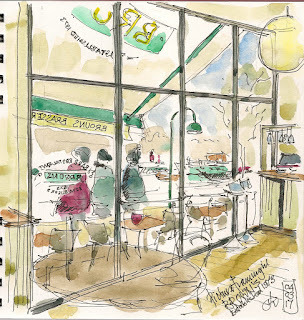 Too cold for the traditional view along to the bridge and boats I sat with a coffee or two and painted through the window enjoying (if not achieving accuratly) the framing and perspective. 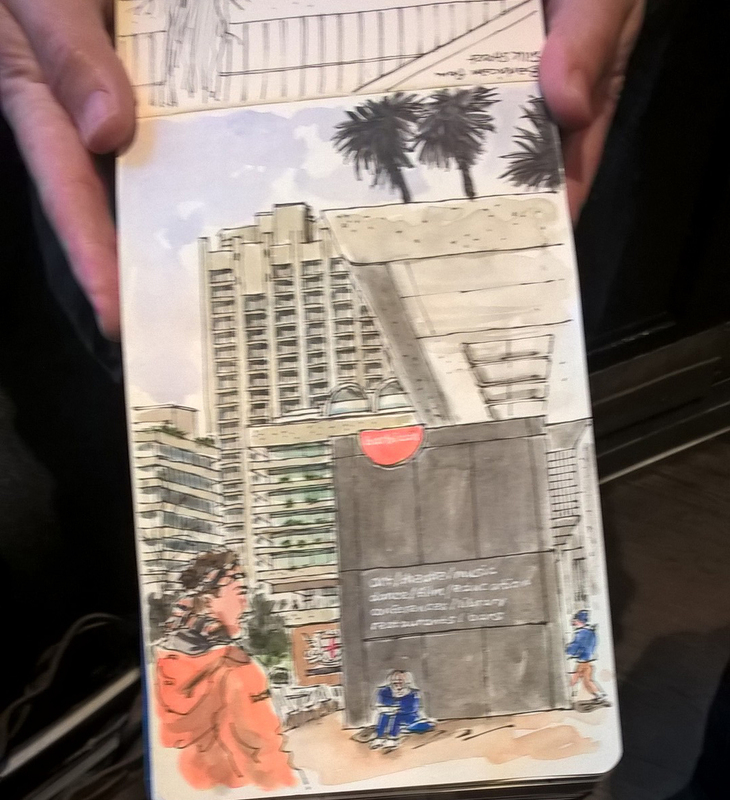 A big thank you to Olga Mackness for organising last week’s sketchcrawl at the Barbican. 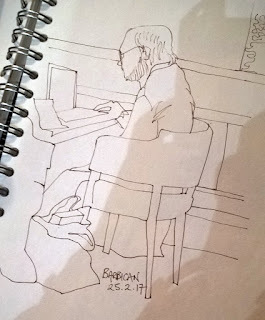 There was a fantastic turnout again and I’ve posted a few snaps of some of the sketches below. If you came along on Saturday, please share your work on the Facebook page or on Flickr, if you haven’t done already, as it is great to see the wide range of styles and subjects. 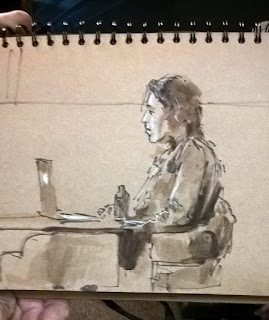 Also, if you post on Twitter or Instagram, use the hashtag #urbansketchers, so that more people can see your work. Next sketchcrawl is Saturday 25th March in the deep south at the Horniman Museum and Gardens in Forest Hill.